Peter Mayle’s autobiographical novel A Year in Provence was published in 1989, ten years after I arrived in France to spend a year of college in Languedoc-Roussillon, the region à côté to the west. During school holidays, carrying a backpack, my Eurail pass, little money and no credit cards, I traveled with friends to Spain, Italy, Greece, Switzerland, Holland and England. But aside from Paris, I didn’t travel much in France. I did visit Carcassonne and the beach villages of Carnon-Plage, La Grande Motte and Sête, but I never made it to nearby Avignon, Aix-en-Provence or the Luberon valley. So when I read Mayle’s book (and later, the rest of his books) set in Provence, I was enthralled. 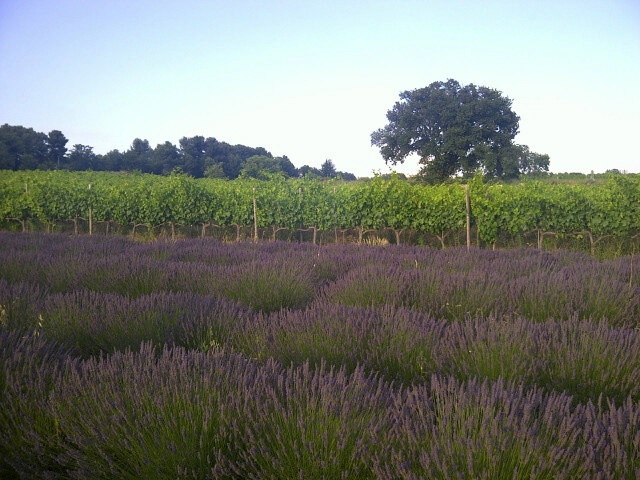 Like so many others, and because I love the south of France anyway, I wanted to visit Provence. Someday. That day turned out to be Thursday, July 5, 2012. My husband and I arrived in Aix the evening of July 4th, after driving* west from Nice. That morning, I thought it would be fun to take the coastal route through Antibes, Cannes and St. Tropez. We would stop in some quaint spot for lunch, perhaps not until Hyères, and then drive on to Aix and arrive at our hotel in the centre ville in plenty of time to relax and have a cocktail. Then we would go to nearby Venelles for a dégustation (wine-tasting) and tour of a vignoble (vineyard) to be conducted in French at Château l’Evesque. We would dine at La Flambée du Luberon, the Château’s restaurant. We made it to Cannes on the congested coastal road, then decided to take the autoroute instead. We did have a wonderful lunch at a café in Hyères, then continued west and north to Aix. We arrived at Hotel Saint Christophe with no directions or help from our car’s GPS *, found the parking garage after two tries, wedged backed our car in a parking space in the garage and checked in. I called the Château to confirm our reservations for the evening and get directions (en français) from Jean Michel Escoffier (I had previously emailed Nathalie, his wife.) Then we decided to have that drink and take a taxi. It was the right decision. We arrived on time and joined un petit groupe of ten French people for a tour of the vineyard and lavendar field, led by Jean Michel –speaking in rapid French and (fortunately for us) talking with his hands. Then it was time for the dégustation with Nathalie, who described the wines speaking almost as fast as her husband had. So far in France, I’d understood about 90% of what I heard, and had held my own communicating in the language that I’d been (re-)studying for a year. But comprehending the Escoffiers was a major challenge — and a highlight of mon voyage. The following morning, on July 5th, we left Aix and ventured into the Luberon valley just to the north. We exited the autoroute at Cavaillon and drove to Apt, then followed a winding road through some beautiful petits villages médiévals made famous by Mayle (and that Madame Marie-Hélène** had advised me not to miss): Bonnieux, Lacoste, Ménerbes and Oppède. There, we stopped for a leisurely lunch before heading to Avignon for the rest of the day and to Montpellier that night. It was hard to leave the Luberon, and I kept thinking about Peter Mayle and his writing. A few years ago, when I was just beginning as a writer but after I had finished the first batch of revisions on my upcoming novel, I wrote a letter to Mayle asking for advice. I sent it to his publisher in New York, hoping that it would find its way to him somehow. * For more explanation about our adventures en voiture, see the post Le Tour de (Montpellier) France. A lovely post. The Luberon really is beautiful and I’m glad that you had a nice time there.